The highlight of Six Flags America, Superman: Ride of Steel is a great coaster with an exhilarating and, er, super first drop. Thrill Scale (0=Wimpy!, 10=Yikes! ): 7.5. Extreme height, acceleration, and speed (although there are no inversions). Type: Out and back steel hypercoaster. Height restriction (minimum, in inches): 52. Its red track dominates the Six Flags America skyline. Just looking at the super-high and steep first drop of Superman from a distance gets your adrenaline pumping. Up close, it takes more than a bit of nerve to hop into line and board the super-sized ride. The coaster cars have elevated seats and low-slung sides. Instead of an over-the-shoulder harness (there are no inversions), an unobtrusive seat belt and a single ratcheting safety bar add to the car's open and exposed feeling—the better to scare the daylights out of you. The coaster has a traditional lift hill (as opposed to an elevator cable-style lift or some kind of launch system). The train click-clack-clicks up, up, and WAY up, until it seems it should be approaching the planet Krypton. Then all hell breaks loose. Superman delivers a delirious high-speed first drop followed by an equally exquisite second drop. There is a nice pop of airtime just before the second drop. From there, the coaster loses a bit of its oomph. Superman certainly doesn't limp along, but the second half of the ride, featuring an over-banked double helix, doesn't pack the same punch as its first act. To coaster fans like us, it's a waste of kinetic energy to take a 73-mph train and send it racing in circles. 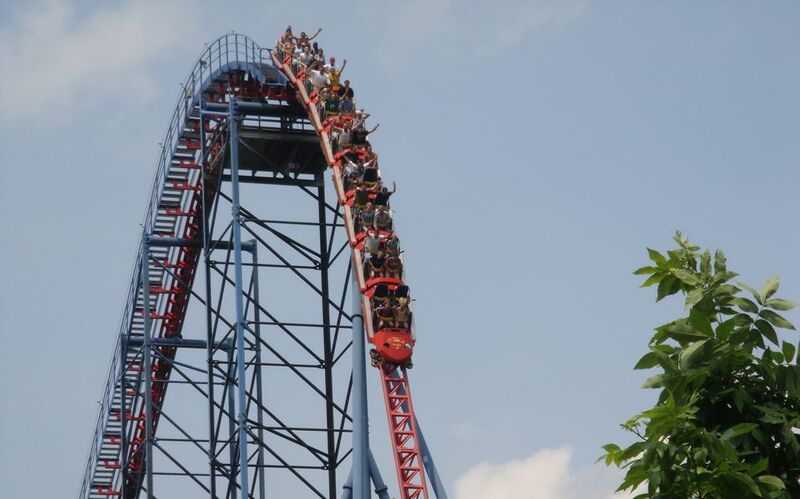 Superman is essentially similar to the Ride of Steel ride at Darien Lake in New York. The park was owned and operated by Six Flags when it debuted the ride, and it was also known as Superman: Ride of Steel at that time. Six Flags sold the park, and the Superman branding was removed. In 2018, Six Flags repurchased Darien Lake, but did not restore the Superman name to its marquee ride. The Superman coaster at Six Flags New England (which also used to be known as Superman: Ride of steel; after a couple of name changes, it is now called Superman the Ride), is a second-generation version of the ride and is, in our opinion, not only a marked improvement over the Maryland and New York thrill machines, but our pick for one of the best steel coasters period. It minimizes the helices, adds a second tunnel (that is filled with fog! ), and keeps the airtime and thrills coming. All three coasters were designed and manufactured by master ride makers Intamin of Switzerland. The New England version is taller, faster, and positively screams to the end. It is also better located in that park for maximum visibility. The Six Flags America Superman is set back and is in a more remote section of the park. Its relative speed feels slower without other rides and crowds of onlookers rushing past. The Maryland coaster is, however, wonderfully smooth. It does include a few great bunny hills that deliver some nice brief spurts of air time. More of those would have made the ride even more super. Washington, DC Odyssey Cruise: Is It Worth the Price? Could You Handle Universal Orland's Most Thrilling Rides?